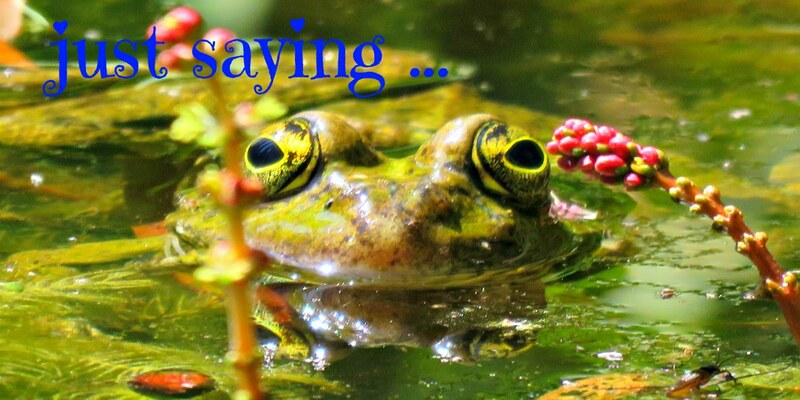 just saying ...: And it's Friday again ... and Good Friday at that! And it's Friday again ... and Good Friday at that! I'm going to have to keep this post short as I've got Mr B's family and my family all here for a Good Friday dinner together, and I've still got a heap of things to prepare. We're at home in Spain, where the weather is simply divine: not too hot, but bright and sunny. I love it here at this time of the year. There are enough people around for Emi to have plenty of playmates his own age, but not too many people to fill the car parks or snaffle all the tables in the cafés and bars. We had the best time just getting here. My parents came over from Ireland to join us for our mad dash through France with the Wonder Dog, and we spent a few days in the Loire Valley where we saw some super duper stuff. 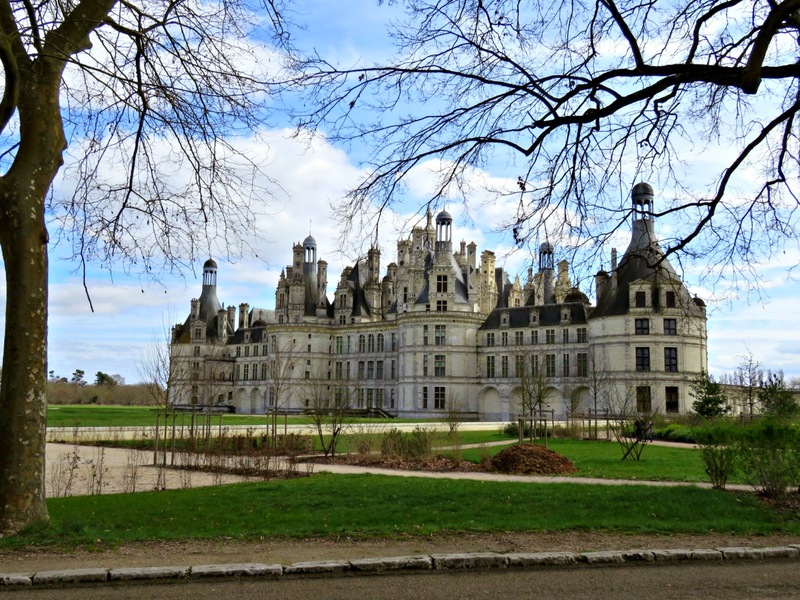 I've already written about the very wonderful Château de Chambord, and I've got to find the time to write some about some of the other places too. Maybe, if I could just manage to give up sleeping ... . I really have to tell you about the Royal Abbey of Fontevraud, founded in the twelfth century, where, thanks to the Marian Cult, the Sisters have been in charge from the very beginning. So tune in next week if you'd like to hear a little bit about Girl Power in the Middle Ages. And then there's the very lovely Château de Cheverny with its amazing pack of hounds. Imagine a hundred hunting dogs all singing in chorus for their dinner ... lovely, so long as you're not a wild boar ... . It was all fabulous, but being simple country folk at heart, my father and I spent many happy hours in the car discussing the sumptuous Charolais cattle of the Bourbonnais, the super-abundance of mistletoe, whether the French were ploughing their fields by computer (there were lots of super straight crop divisions without any drainage channels or fences to show where to stop) and the varieties of early flowering shrubs along the road-side. Mr B, who's a bit of a city-slicker (born and bred in Barcelona), found our down-to-earth interests unfathomable. Why are you interested in that? It's an interesting experience being locked up in a confined space with a group of people for several days. I guess it either makes or breaks relationships, but in our case we emerged happily at the other end, all of us still on speaking terms with one another. 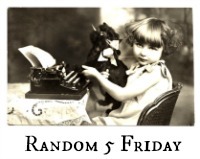 Anyway I'd better get going with 5 random things, otherwise Nancy will throw me out of Random 5. 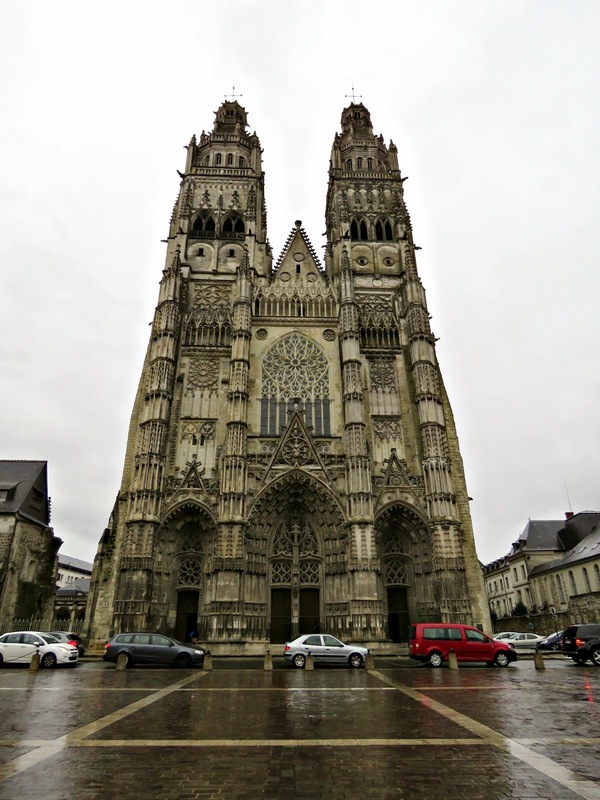 Let me show you 5 random aspects of the very wonderful Cathedral of Saint Gatien in Tours. Given that it's Easter it seems kind of on-theme to take a walk around a great Gothic cathedral. Isn't it a beauty? Sorry about the rain. It would have looked even better against a beautiful blue sky. I'll have to see if I can do better with the weather next time. There's been a cathedral here since the fourth century, but it's been burnt a few times over the course of its history. On one occasion it was torched by our own Henry II, husband to my great heroine, Eleanor of Aquitaine. The present structure is mostly twelfth century with modifications and add-ons that carried on up until 1547. The flying buttresses are outstanding, and the forest of gargoyles looking down from the eaves would surely have been enough to put the chills on all but the most courageous of medieval spirits. That's little Emi, who's been abandoned to shuffle down the aisle on his own as all the adults gasped and shot off in various directions to investigate what caught their various fancies. Poor lamb: he's used to it! 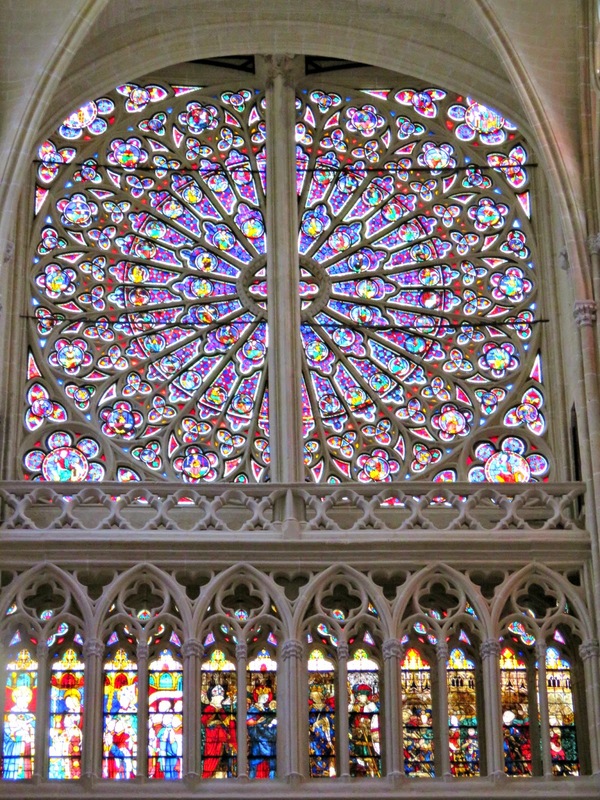 Inside there's a great rose window from the XIII century dedicated to the Virgin, the Holy Rose of Heaven. And another beautiful one, also from the XIII century, showing the Nativity. I love stained glass windows. The colours are just so brilliant and intense. I can't begin to imagine the awe that they must have inspired way back in the thirteenth century among the ordinary folk of the area whose lives would have been hard and lacking in either colour or decoration. They must have served to reinforce, with their vivid details, the stories from the Bible that all too many of them weren't able to read for themselves. And, at the risk of being accused of not being able to count, let me show you one of the medieval shop fronts that's been preserved in the streets running away from the cathedral. 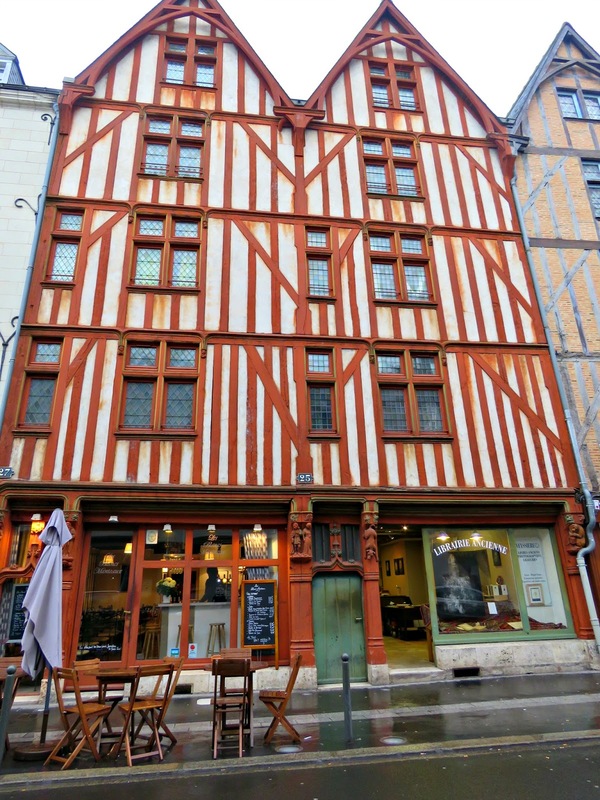 It's wonderful that it houses an antiquarian book shop with a coffee shop next door: a sublime coupling of interests! Can you see Mr B and me? Our reflections are staring back at you. I'm the short one with the camera. And now I really must dash, otherwise we're going to go hungry and my relatives are all going to be very unimpressed with me. 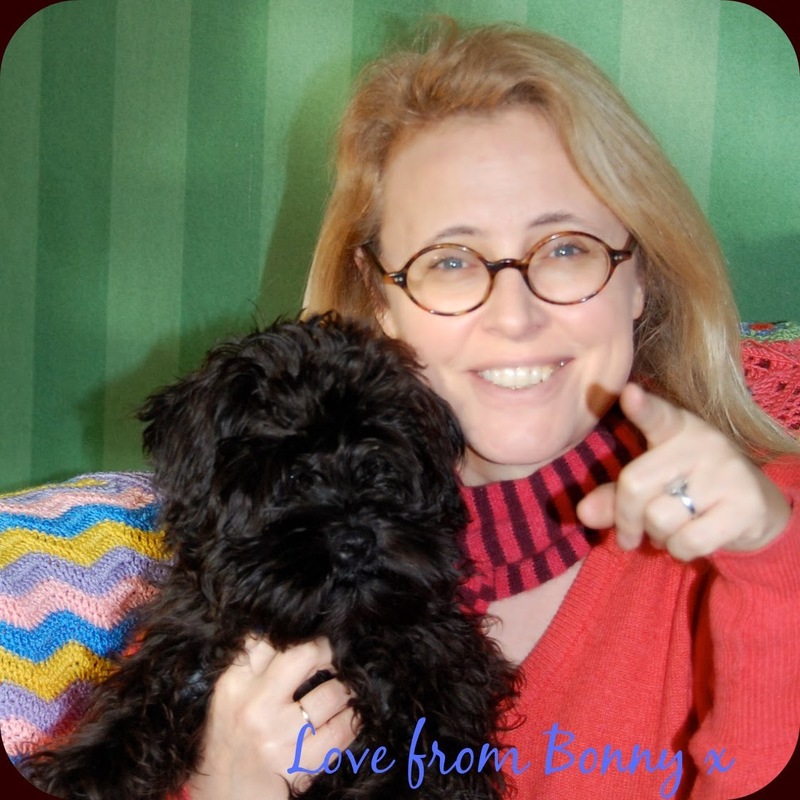 Bonny, Your life of adventure inspires me! I enjoyed reading about your family - and especially your conversations with your father! 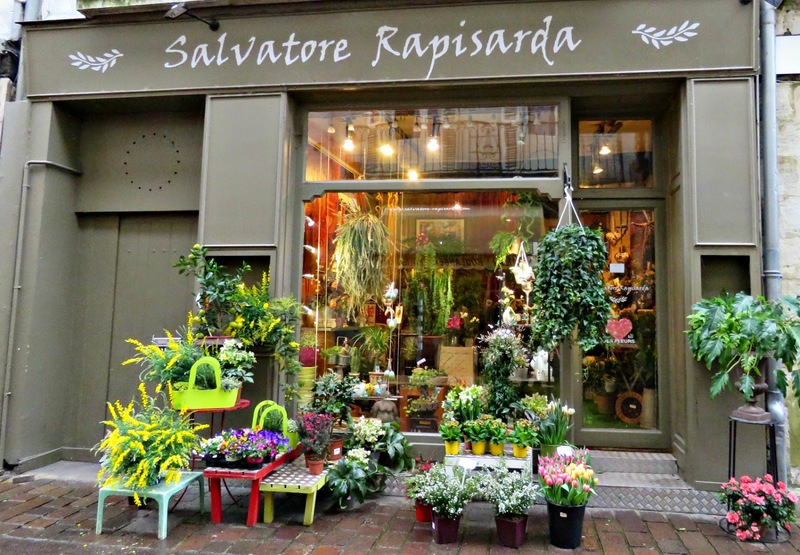 I love my history lessons you share, but WOW a book shop, a coffee shop and a flower shop all on the same excursion! I'd have asked to be left there for the rest of the day - just swing by and pick me up at closing! Enjoy your holiday with family and soak in every experience! Marvelous post. Loved reading about your family and your talk with your Father ... fun! 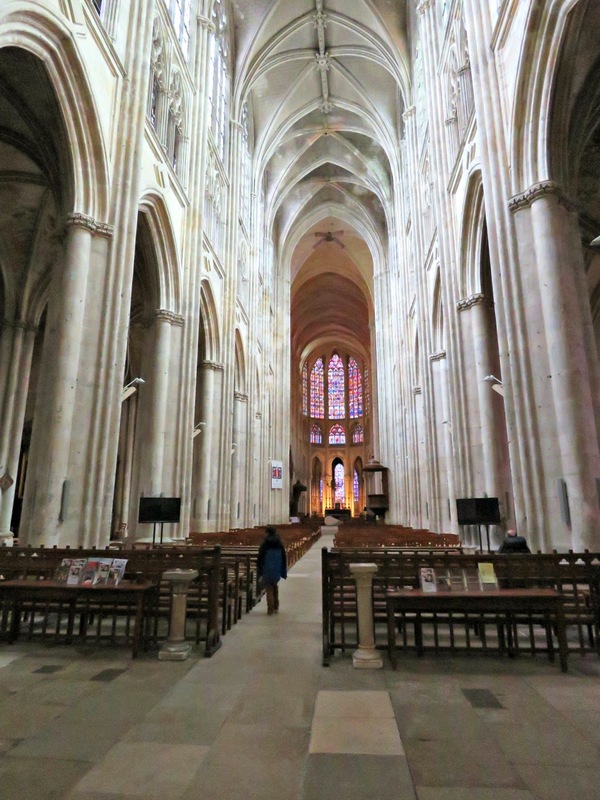 Thanks for the tour of the Cathedral of Saint Gatien in Tours. Beautiful ... rain and all! And the area around the cathedral -- more fun! Happy Easter. Enjoy your family. Wow! I mean Wow!!!! What an amazing trip...what incredible sights and your photos are wonderful! Wow, wow, wow!!! Oh my gosh that Cathedral is amazing. I also like the look of that Abbey you featured above. How lucky you are to travel and see such wonderful things. I'm glad you enjoyed family time (and didn't kill each other). Happy Easter. Stunning cathedral... 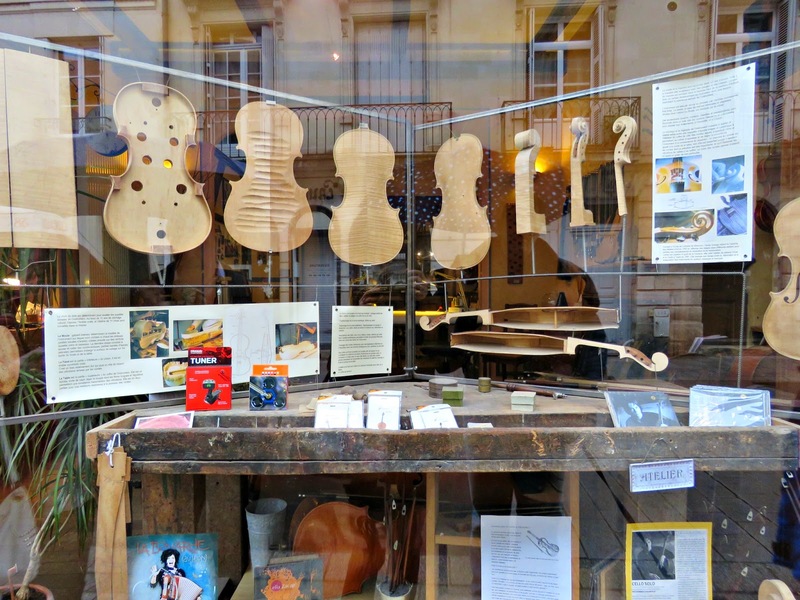 I miss them from Europe, and the violin shop is pretty neat too. Love that window front photo. That cathedral! Oh my goodness! I too love stained glass. So gorgeous! Thank you for taking us along with you, such a wonderful tour. 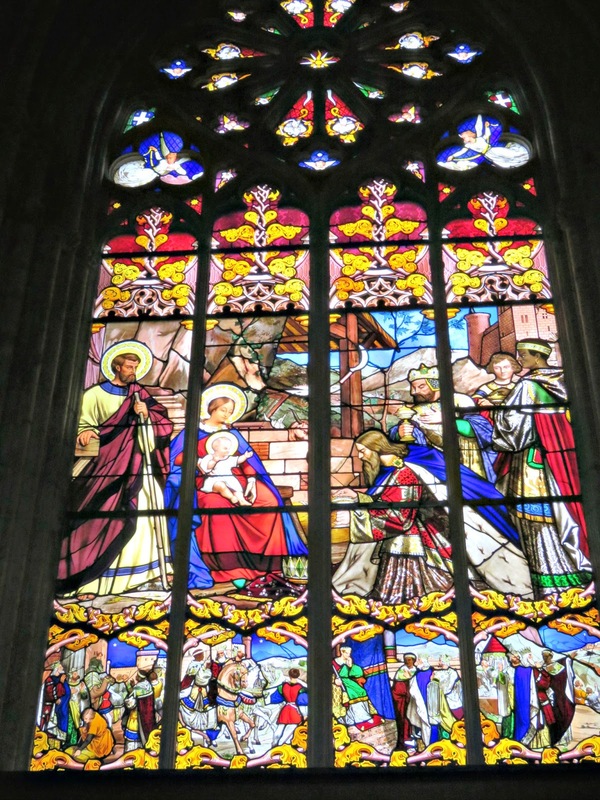 Stained glass has always memorialized me with their brilliant colors and designs. Always looks forward to your weekly finds.